One Nation Under CCTV is a graffiti artwork criticizing the use of surveillance by the government. It was created in 2007 and was located on Newman Street in London. It was created by London-based guerilla artist Banksy , whose identity is still not known by the public. He is known for his satirical, dark, yet political grafitti artwork that he randomly places throughout the world without notice. He is known for commonly critiquing the government. In this artwork, we can see a child in a red hoodie is paiting the large, "ONE NATION UNDER CCTV" while being surveyed by a police man with his dog. It is ironic and intentional that the piece is right next to a surveillance camera. CCTV stands for "closed-circuit television" and is another way of saying video surveillance. 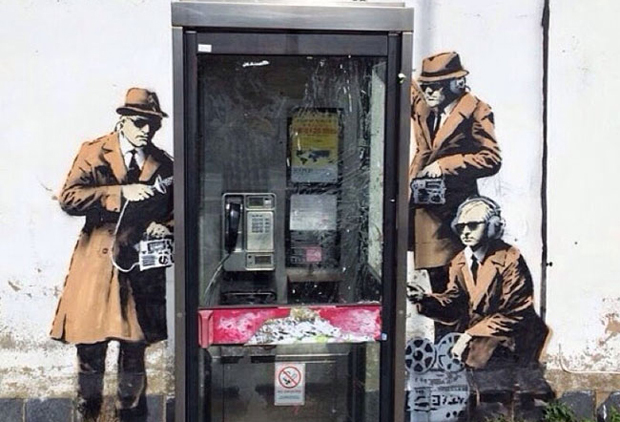 In another piece critiquing the government and surveillance, Banksy grafitti's what seem to be 3 spies that are surveying a phone booth with recording and listening devices. assumed that he is leaving it up to the viewer's interpretation. CCTV has become a worry since before internet even began, when the government, private detectives and corporations began wire tapping in the late 1800s . It started to become a National American concern during the "Watergate scandal" when the public saw the abuse of wiretapping by the government. The concerned peaked again recently when Edward Snowden released information and databases of the NSA . Currently, the reason to keep surveillance is a matter of national security. Because of this, some people choose to stay disconnected and what is called "off of the grid", which refers to people who only use cash, no permanent phone, and keeping nothing personal. Banky's art is a reference to all of the concerns about surveillance. His art evokes a meaning that says that we are controlled by surveillance and that everything that we do is watched or listened by somebody. Overtime, these artworks were eventually taken down by the government or destroyed by unknown sources.